A journey through an ancient kingdom on the edge of change. 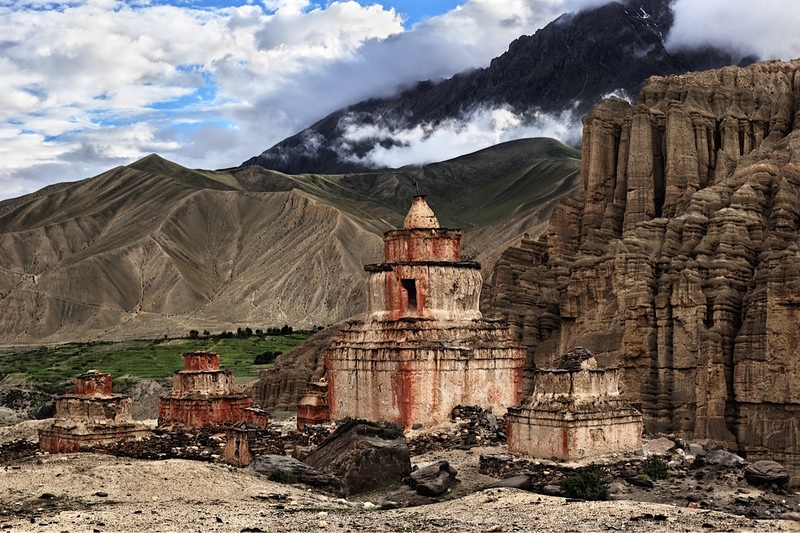 Sheltered by some of the world’s highest mountains, the 8000-meter peaks of Annapurna and Dhaulagiri, bordering China and the Tibetan plateau, lies the ancient “Forbidden Kingdom” of Mustang. Also known as the Land of Lo, Mustang is sometimes confused with the mythical Shangri-La. 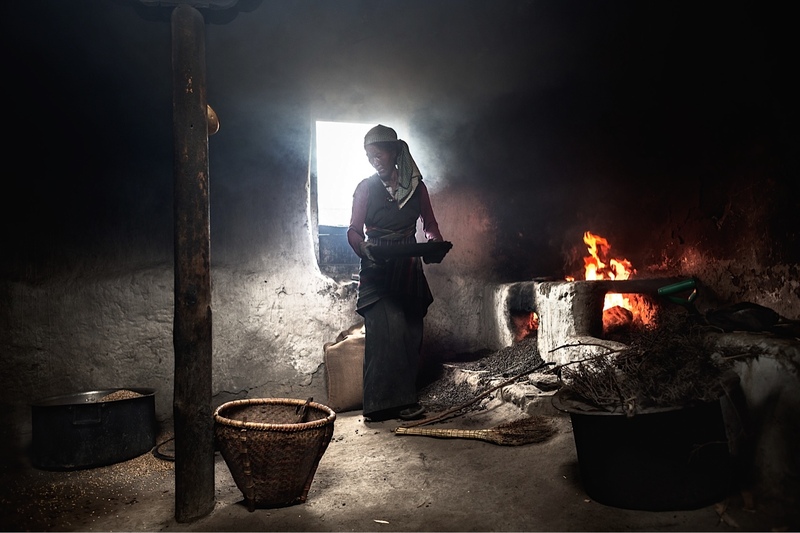 Resolutely off-limits to foreigners until 1992, thanks to its ancestral isolation Mustang retains its ancient culture almost intact, and remains one of the last strongholds of traditional Tibetan life. The region is still restricted and hard to access, with foreign visitors required to obtain special permits and pay some fairly steep fees. Capital Lo Manthang is home to the Loba people, the original inhabitants of Mustang. A walled city, it is considered by some scholars to be the best preserved medieval fortress to the world as is a UNESCO World Heritage candidate. The last king of Mustang, Jigme Dorje Palbar Bista, whose lineage dates back to the warrior Ame Pal who founded the Buddhist kingdom of Lo in 1380, is now retired in Kathmandu. After the civil war and overthrow of the Nepalese monarchy, Nepal became a republic, and Mustang lost the status as a tributary kingdom it had held from the late eighteenth century, and became a district of Nepal. 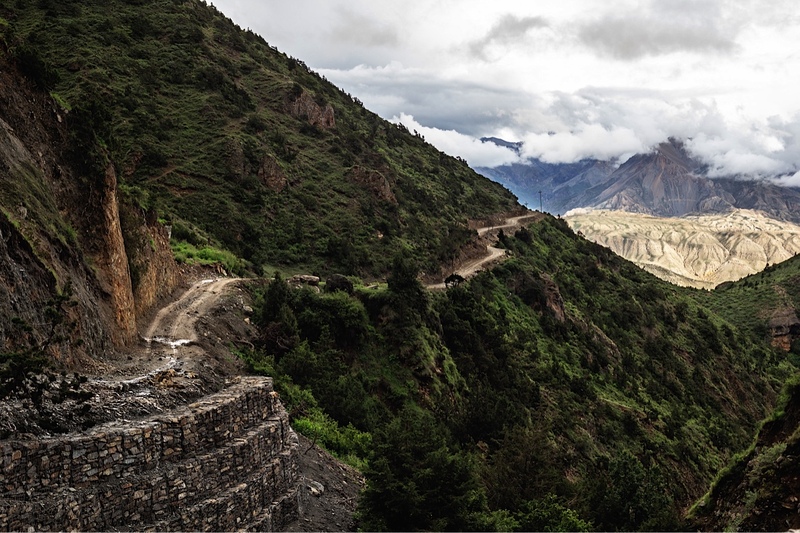 With the ongoing construction of a road through Mustang that will connect China with Nepal, the region is seeking to regain its strategic location. For centuries caravans roamed the Kali Gandaki between Tibet, China and India, with salt, yak wool, cereals, dried meat spices and other goods. When the road is completed, it will become the most accessible Himalayan corridor and Mustang will inevitably change. Young and old, the inhabitants of Mustang understand the road’s importance, but they fear the loss of their culture and identity. David Rengel is a Spanish documentary photographer. Lo Manthang, the capital of Mustang, is a walled city considered by some scholars to be the best preserved medieval fortification in the world. It was built in 1440 by the legendary warrior Ame Pal. 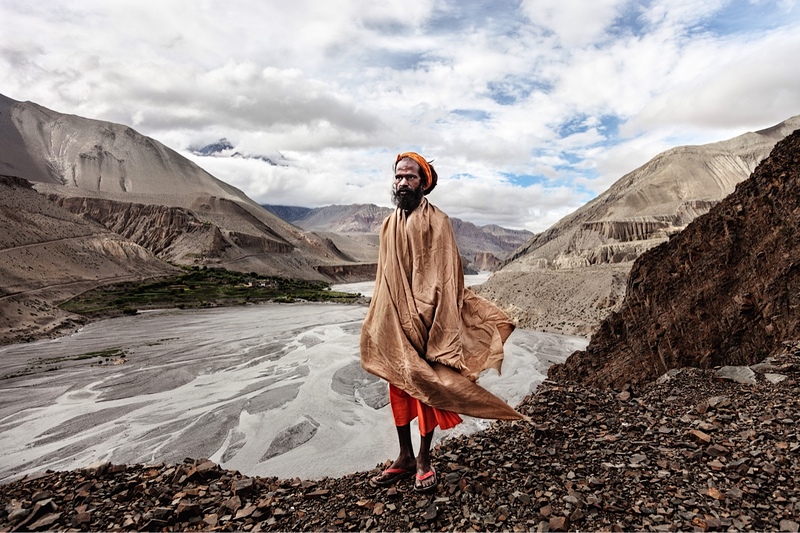 Ana Baba is a pilgrim, a Hindu Sadhu exploring Mustang on foot. Behind him is the entrance to this Mustang from the town of Kagbeni and the immense river Kali Gandaki, the historic route of pilgrims and caravans of merchants. 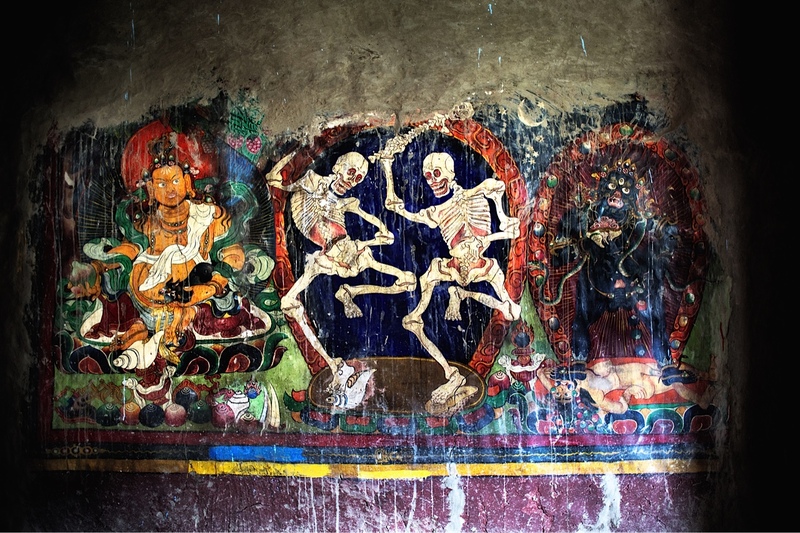 Tantric Paintings on the walls of the Monastery of Gheling. The figure on the left represents Padmasambhava, founder of the Nyingma School of Tibetan Buddhism. The figure on the right is Mahakala, an ancient demon that became the protector of Dharma. The dancing skeletons. in the center are known as the lords of the cemetery and represent the ancient religion Bon, which predates the arrival of Buddhism in Nepal and Tibet. This and other jewels of Tibetan art are in poor condition due to lack of financial resources. 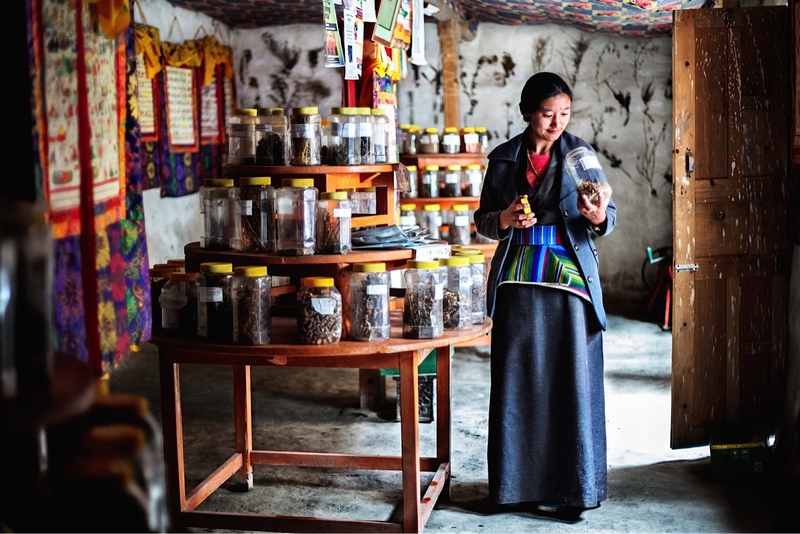 In the traditional medical school of Lo Manthang a young Amchi, or traditional doctor, and daughter of the royal family's doctor, holds a bottle with healing plants. The number of female students of Tibetan medicine has increased markedly in recent years. Traditionally, Loba doctors were considered not only as doctors, but were regarded as wise and were chemists, botanists, alchemists and magicians. They practiced medicine whose origins date back more than 2,000 years. The Amchi begin training at an early age, with skills and knowledge transferred from teacher to student, often from parents to children and today combine traditional knowledge of medicinal plants with techniques learned in college. The new road linking China with Nepal is visible and passable in lower Mustang. The road makes it easier for vehicles to traverse the 3000 meter peaks. 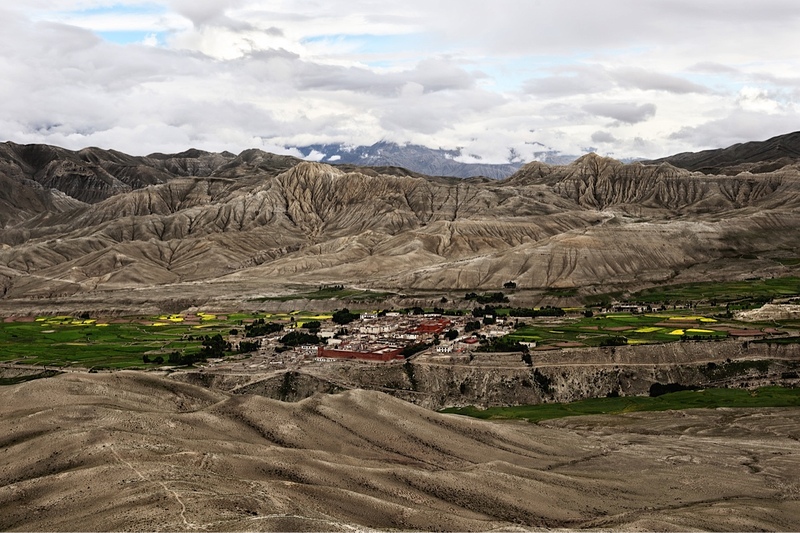 The landscape becomes more arid as one makes the ascent into Lo Manthang, the capital of Mustang. 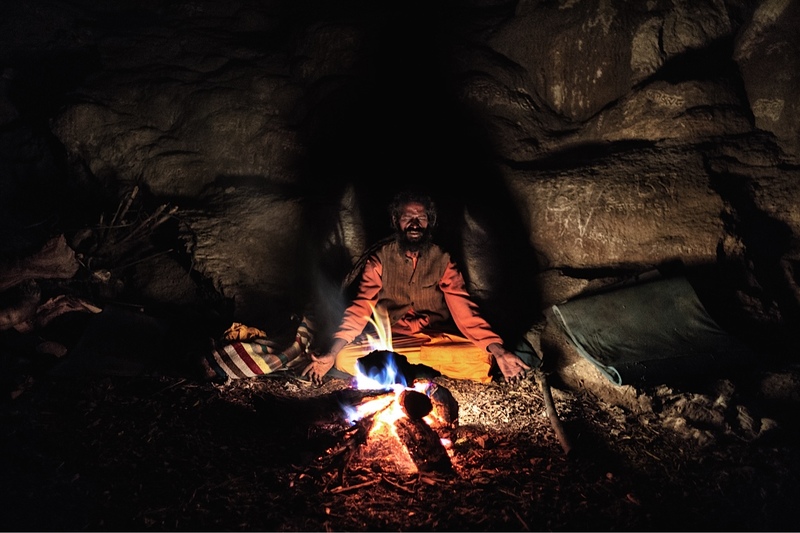 Ana Baba, a Hindu Sadhu meditating in the cave of Ranbyung, one of the oldest and most sacred in the Himalayas. In the eighth century, Padmasambhava, known as Guru Rinponche, meditated in this cave. Born in India to a Brahmin family, Padmasambhava embraced Buddhism, and traveled Mustang before heading to Tibet to preach and introduce Tantric Buddhism. Mustang's residents are proud of the fact that Buddhism came to Tibet through Mustang. They consider Padmasambhava the second Buddha. 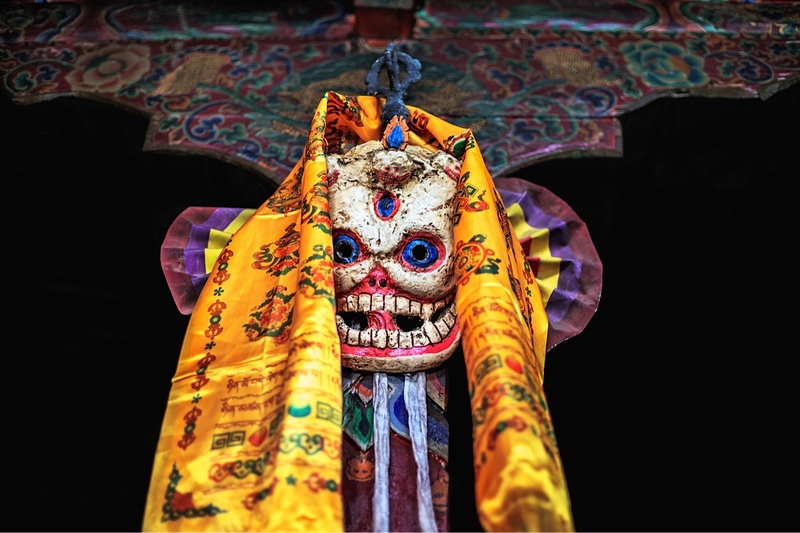 A mask used by monks in a dance initiated by Padmasambhava at Samye Monastery in the eighth century. The dance serves to remind the viewer of the ephemeral nature of things and the liberating impact of knowledge of this reality. Padmasambhava unified the ancient Bön beliefs with Tantric Buddhism through these dances. These skeletons used in the dance are popularly known as Chitipati. 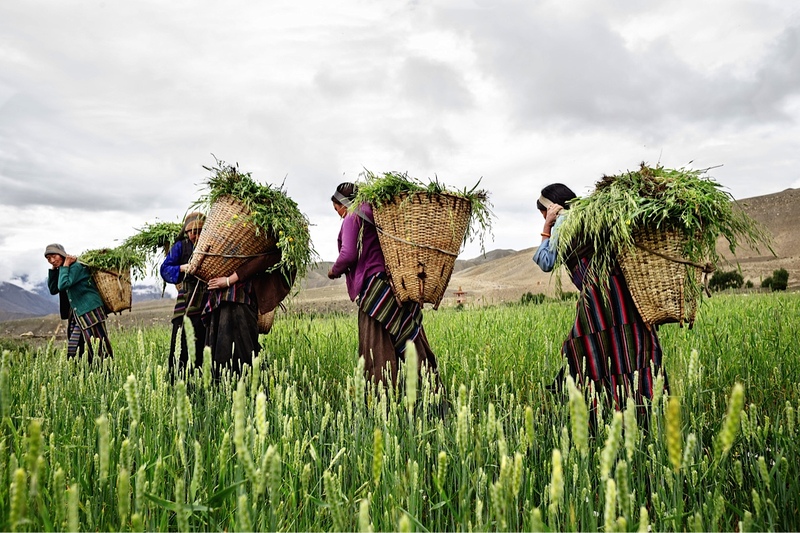 Women in Tsarang carry wicker baskets full of grass they have collected early in the morning, after cleaning the fields of buckwheat. The grass will be used to feed animals. Summer is growing season, and during this time of year the people must gather food for the harsh winters. 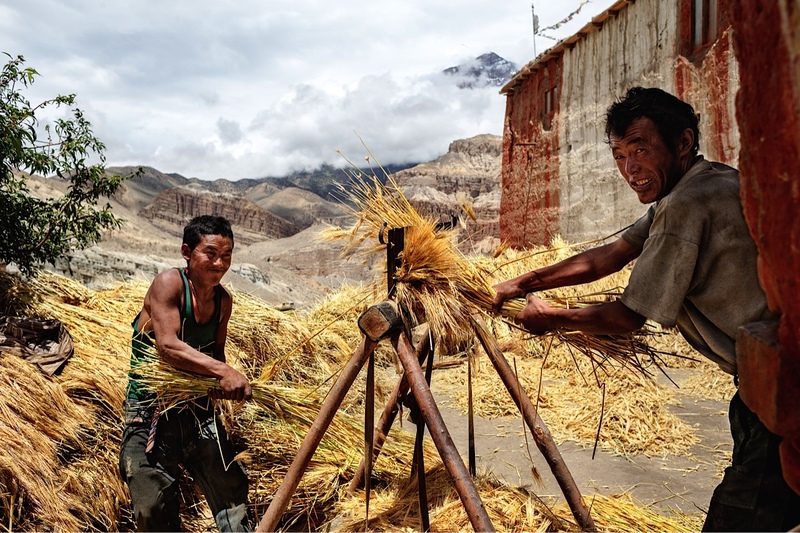 The main crops in Mustang consist of barley, mustard and buckwheat. Corn, apples, apricots and vegetables are grown in the lowlands. A woman in the palace kitchens, toasting cereals for food. As wood is scarce, people use dried animal dung for fuel. Chortens near Ghami. According to legend, this is one of the places where the remains of a demon who long ago terrorized the Kingdom of Mustang fell to earth. A chorten, or stupa, is a monument. From a red square base (representing the earth) rises a great white hemisphere (water) with something like a needle (fire) topped by a crescent (air) and a solar disk (space). A father and son thresh grain by hand. The straw will be used for roofs, baskets, and feed. Father and son work tirelessly from dawn to dusk in the fields of Chuksang. In summer they must collect all the grain that will provide them with their food during the harsh winter. The Druk Gawa Khilwa (DGK) nunnery in Katmandu teaches its nuns a mixture of martial arts and meditation.